All aliens are not, of course, equal. While a novice may be overwhelmed at any manifestation of Alien presence, he will soon learn to cope, and discern the abilities of his enemy. For those who aren't yet well-versed in such things, here's a rundown on how mean each of these creatures can be in a fight. For more details, look at aliens' specific pages or the stats page. These guys are the worst. Not only are they bad soldiers but they're pathetic traitors to boot. They have marginally better health and armour than the Aquatoids (though worse at actually shooting) but have no M.C. ability whatsoever with the sole exception of the Commander rank, who isn't especially good at it anyway. Gillmen have no redeeming features whatsoever from a military standpoint, and we can only assume the aliens use them as cannon fodder by testament of their frequent appearance on the battlefield. They have all ranks except for the Medic and Navigator. Methods of Disposal: Pretty much anything. Note however that Hydro-Jet Cannons, Gauss Pistols and especially Jet Harpoons will usually not kill them in one hit. You will need to have examined a dead Gillman in order to unlock the Thermic Lance. Their associates are perhaps of more interest. Melee only units with powerful claws. These guys can take a bit of a beating due to their high level of health and are pretty fast, but they don't have any special resistance to any weapons so sustained fire of any kind will drop them. Eventually. Calcinites have no ranks and are found in the company of Aquatoids and Mixed Crew on land missions. Methods of Disposal: Gauss or Sonic preferred, but Explosives and Gas Cannons can be useful. A dead Calcinite is required to unlock all the melee weapons, starting with the Vibroblade. The Hallucinoid is a large floating terror unit that primarily attacks with a lethal "cold-based" melee attack. It does not have a ranged attack, despite the UFOpaedia entry, and attacks only with its tentacles (which deal ordinary melee damage, not Freeze damage). Hallucinoids have no ranks and are found in the company of Aquatoids and Mixed Crew on underwater missions. Methods of Disposal: Sonics or powerful explosives are preferred. Most other weapons will work, but on higher difficulties it will take many shots thanks to Hallucinoids' high health and considerable armour. They do have a weakness to Phosphor rounds, but Phosphor is so ineffective underwater that it's usually not worth the trouble. Hallucinoids are able to alter their depth (i.e. "fly"). This can make it harder to hit them thrown explosives or melee weapons. On the other hand, it makes misses with ranged area-effect rounds much safer. The unfortunate result of human entanglement with a Tentaculat. Zombies are slow and armed only with a (strong) melee attack. This makes them easy to evade, run away from and kill. They are completely immune to stun weapons and leave a nasty surprise for you upon their death: A newly emerged Tentaculat with full TUs and a hunger for tasty X-COM flesh. Note that this will be a Tentaculat at base stat levels that have not been adjusted by difficulty level. This is a reprieve on Superhuman difficulty, but a curse on Beginner difficulty. Zombies have no ranks and can only be found where there are already Tentaculats which (thankfully) means at least you don't have to worry about Civilians feeding these things. Methods of disposal: Ranged weapons preferred over melee weapons due to the danger of being too close, though melee weapons are probably the most effective if you are willing to risk being next to a dead Zombie when the Tentaculat emerges. HE is good, Sonic and Gauss are fine, AP is weak. Just as long as you can take care of the resulting Tentaculat 'surprise' as well; if you can't, flee and let the zombie waddle after you (it's safer!). If all else fails, try to strike the killing blow with a phosphorous attack. This prevents the embryo from hatching. There is no in-game UFOPedia entry for this creature, as they can not be stunned, captured or researched - not even corpses can be recovered. The grainy image above is from XCom tactical video footage. Distant relations to the Sectoids, these guys have much the same strengths and weaknesses. They make at best average soldiers having pitifully low health, so why are they 'medium threat' you ask? Aquatoid Technicians, Navigators and Commanders have Molecular Control abilities, and the higher ranks can be pretty good at it (the Commander has the most powerful MC you'll ever face). Aquatoids can be of any rank (they are the only race to have Medics). Methods of Disposal: Anything, Staring, Harsh Language - they really are that weak. 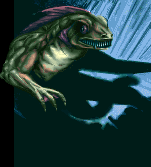 Probably the biggest mistake the aliens made was creating the Deep One as they are the basis from which X-COM goes about unlocking the most important secrets: Armour and Advanced craft. Although they're pretty resistant to the basic 'bought' weapons, they're simply fodder for anything else. While the in-game illustration shows them holding something that looks like a PWT cannon, they are actually armed with what appears to be an electrical mortar of some kind which is unaffected by armour and does not require a direct line-of-sight to its target, thankfully it is woefully inaccurate. This weapon is geared towards dealing maximum damage to human foes, and does less damage to other aliens. Note that this weapon cannot be recovered by X-com. Deep Ones have no ranks and are found in the company of Gillmen and some Mixed Crew on land missions. They can be found in water during the second and third levels of T'leth, as well as on one type of Mixed Crew Dreadnaught. Methods of Disposal: Pretty much anything really. It cannot be overstated how vitally important these creatures are to your research, you will require dead examples to unlock research into Aqua Plastics and Plastic Aqua Armour, and afterwards live specimens to unlock Ion Armour, advanced Submarines and advanced SWS models. Probably the rarest of all the TFTD units. They resemble a giant nautilus that move backwards, with their tentacles facing the front. 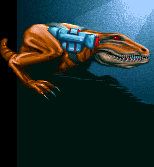 They have fairly decent stats they don't seem to move around much, preferring instead to 'camp' a particular location and use their good reflexes to tag intruders with their particle cannon, which seems to be roughly equivalent to the Sonic Cannon making it fairly decent at cracking X-COM armour. Amongst the aliens, the Xarquid feature some of the higher end external armour, making low powered weapons ineffective. Being a 2x2 unit it is however very vulnerable to explosives or stun damage. Xarquids are found in the company of Gillmen and some Mixed Crews on underwater missions. Methods of Disposal: Explosives, Armor-Piercing weapons (especially mid to high powered drills). Another pretty rare unit, the Triscene is on first appearances a formidable foe with its twin Sonic Cannons and melee attack along with lots of Time Units and health. Note that the side cannons on it do resemble the X-COM Craft PWT cannons - but are only for show. While a dangerous foe, its biggest weakness is its non-existent underside armour which means it can be even be felled with a Magna-Blast Grenade. Triscene have no ranks and are found in the company of Tasoths and some Mixed Crews on land missions. These orange instruments of doom are the Muton of TFTD. Big and tough, but not really the sharpest knife in the alien drawer. Despite this they are very flexible opponents as they can fight with standard weapons or their built-in claw attacks, which can give even the most well protected aquanaut a major pounding. They lack external armour, but have insanely formidable resistances that allow them to shrug off between 50% and 80% (!) of most damage types. Combined with plenty of health, this allows them to sustain unreal amounts of damage before dropping dead. Thankfully this is balanced by Lobstermen taking more damage from stun or drill type weapons. Lobster Men have all ranks except for Medic, and none of them have any M.C. ability at all. Methods of Disposal: Thermal Shok Bombs (or Tazers if you're feeling brave), drills, lots of explosives, Sonic weapons and lots of clips. A live Lobster Man Commander is required to research the Leviathan Assault Sub and "T'Leth, the Alien's City", both of which are required to finish the game. Earlier versions of the game required a Lobsterman Navigator for Magnetic Navigation. Fast and agile, these guys can be quite a nuisance as they have plenty of TUs to run around and lots of health to soak up damage, although they don't really have any special resistance to any weaponry. Tasoth come in two flavours: Soldier and Squad Leader. Both ranks are more or less the same except for the leaders having slightly better stats. and more importantly Molecular Control ability. Methods of Disposal: Sonic weapons are preferred, but strong explosives and melee weapons will also do the trick. Gauss weapons can work in an emergency, but bring lots of ammo (4-5 Rifle hits are required per Tasoth). A live Tasoth of either rank is required to research the M.C. Disruptor. Like miniature Cyberdiscs with high TUs, very high health, and a sonic weapon with the best accuracy in the game. These things are a menace that can not only cut your men down in their own turn, but take a considerable amount of punishment before falling, and when they do fall they explode. Firstly they don't self-destruct if they are killed by melee weapons (this includes the Thermal Tazer). Second, they have a secondary melee attack which they prefer to use in close quarters - but it is INCREDIBLY inaccurate (0%, probably a bug), so if you stand next to it you probably will survive. And last, they leave a trail wherever they go. If you see a burned path in the ground, you can often guess their locations. This is even more effective for parts of the map that have already been sighted, as you'll be able to visually see the burnt path being created after each turn. Bio Drones are found on Lobstermen, Tasoth and Mixed Crew land missions. Methods of Disposal: Gauss, Sonic and Explosives from as far away as possible; or Melee as close as possible. Tentaculats are very similar to a Chryssalid. These big brain creatures have the same ability to proliferate by zombifying their targets into mindless walking incubators for their young. They are only found in water and are generally found guarding Dreadnaughts, Battleships or alien structures. Tentaculats are able to raise or lower their elevation in the water with impunity. In short: Underwater flying Chryssalids. The one saving grace is that no civilians are ever encountered on the same map as tentaculats. Tentacults have a high distribution of front armour, but their rear and sides are weaker. If encountered early with weaker weapons, try to hit them from the flanks or rear as much as you can. Liberal use of explosives generally does the trick. Tentaculats have no ranks and are found on Lobsterman, Tasoth or Mixed Crew underwater missions. Methods of Disposal : Sonic weapons, explosives and a healthy dose of luck. This page was last edited on 11 December 2017, at 01:18.